Summary: Duolingo in general uses a ‘gamification’ approach to make learning fun and to motivate learners to study. You progress somewhat like in a video game by leveling up to reach the next set of challenges with each task aimed at making you learn the language. The Portuguese version includes elements of Brazilian and European Portuguese though you will learn next to nothing about the culture of these places. While it is free, there are a number of downsides to what is on offer. It could, however, be useful for learning vocabulary but that’s about it. A beginner will learn a bit of Portuguese but they would do much better looking elsewhere. Duolingo is really well put together and is easy and fun to use. Unfortunately the content itself isn’t great. The content is very poor in comparison with other learning resources. Barely any explanations so you just mimic everything. It’s great that it’s free. For learning vocabulary it could be useful but only in addition to something else. It is really nicely designed which makes it enjoyable to use. By making language learning a game it helps encourage people to keep studying. They’ve helped democratise language learning by making the resource free. The ‘Stories’ part of the resource is an interesting and innovative way to ‘read’ a story. It’s basically an endless matching game where you match Portuguese words to their English equivalent. The content is poorly explained (if at all) so you learn by copying rather than by actually understanding how the grammar matches up. You might learn some words and phrases but it is highly unlikely that you’ll be able to communicate very well. The fact that there is no cultural immersion does not help either. Nonsensical content. Some of the sentences are completely useless and don’t make sense. Price: The best thing about Duolingo is that it’s free. While there are a couple of ads every now and again, they are unobtrusive in comparison with other platforms. You can pay to remove them, however. One ad-free month is 9.99 Euros otherwise it’s 6.99 Euros if you pay for 12 months. PortuguesePod101 and Semantica are two resources that will provide you with a much more comprehensive path to learning Portuguese. In the past, I used to use Duolingo quite regularly. I remember progressing quite far with it until the learning style became a bit repetitive. My vocabulary increased but my knowledge and understanding of grammar did not improve. 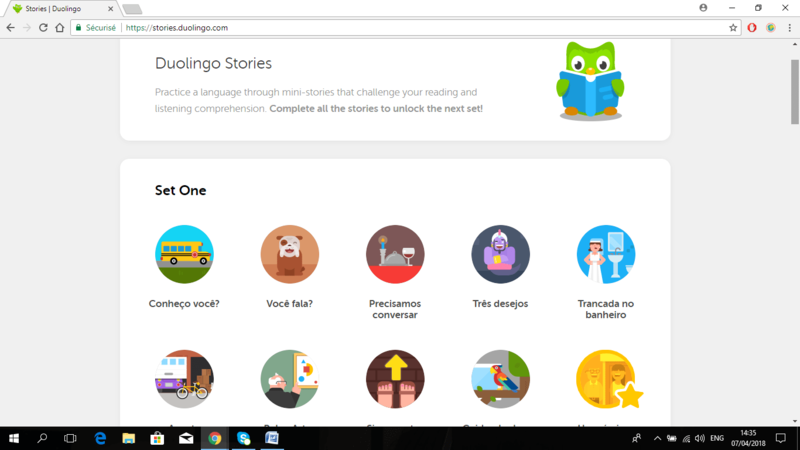 Since then I’ve tried a number of different learning resources to help improve my Portuguese and Duolingo now feels inadequate and pretty poor in comparison with them – I am actually quite disappointed with my younger self for having wasted so much time on it! There are way better language learning resources out there so your time would definitely be better spent elsewhere. 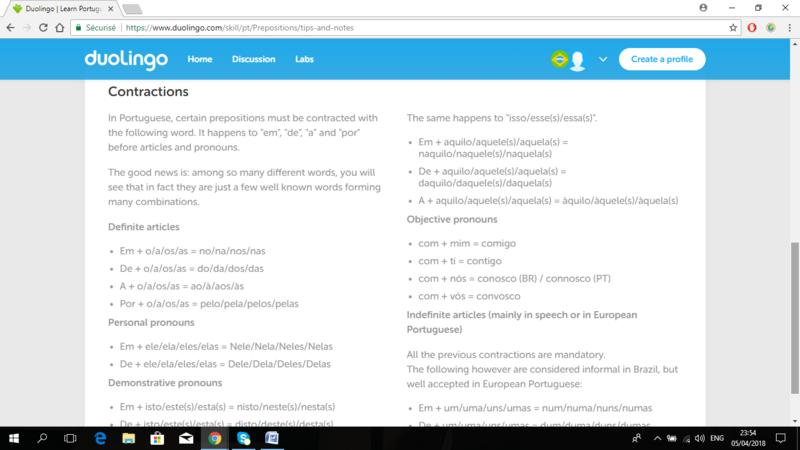 Semantica and PortuguesePod101 are just two resources which are much much better than Duolingo and will certainly help you progress in your Portuguese studies. Their courses will immerse you in Brazilian culture, explain the grammar and give you a variety of exercises to test what you have learnt so far. They pretty much trump Duolingo in every category imaginable. Having said that though, there are a couple of good things about Duolingo. It’s free! This means that anyone can sign up and start learning within seconds. The game aspect of the course does make you come back and do more than you probably would have otherwise. Finally, Duolingo is quite useful for people looking to increase their vocabulary although you will not learn how to speak Portuguese through using it. Funnily enough, however, I don’t think the content is even good enough for casual learners looking to learn a few phrases before going on holiday to a Portuguese speaking country. The progression of lessons in Duolingo is all over the place so won’t even provide a useful build up in terms of essential phrases and vocabulary. Duolingo is possibly useful for beginners looking to add to their vocabulary (alongside another learning resource) and people who would not otherwise attempt to learn a language at all but stick with it a bit due to the gaming side of it. So if you really want to learn the language – look elsewhere! Duolingo is available on the PC or as an app on your phone. The PC version is much superior which is a shame because casual learners probably use it mostly on their phones and in doing so miss out on quite a few of its features. Having said that though, if you’re on the computer anyway, you might as well use a better resource than Duolingo! The Portuguese ‘lessons’ on Duolingo are divided into different ‘skills’ such as Basics, Colours, Prepositions, Family, Past Tense, Imperative etc. Some of these have just one part to them while others consist of up to ten sections. There are 69 of these different skills and they gradually progress in difficulty level. In the beginning, you start off learning about colours and food while the last couple of skills deal with spirituality and politics. To keep unlocking new lessons you need to complete the different skills to progress through the levels. All of the lessons follow the same format and to complete each one you need to answer enough questions correctly. You get tested through a number of ways on the material that is the focus of that particular lesson. Sometimes you test your pronunciation by speaking into the microphone and repeating a sentence. Other times you select the English words to match the Portuguese sentence and vice-versa. Another variation that crops up is to write down what you hear from the audio that plays. After a while, it becomes a bit repetitive but Duolingo keeps motivating you by giving you points and little motivational pep talks. On the computer, you have an option at times to look at lesson notes that briefly explain the grammar point or vocabulary of the lesson. Phone users do not have this option so must simply mimic or parrot the words and phrases without gaining a deeper understanding of how Portuguese works in practice. For slightly more advanced learners, there is a section available on the computer called ‘Duolingo Stories’. These are short interactive stories which need your input to continue. You answer questions about what is going on, add the appropriate conjugations and at times speak into the microphone to say some of the sentences. It is quite innovative and I found it interesting to use though again the lesson content is pretty random and the beginner levels at least do not look at cultural aspects of Portuguese speaking countries. There are six levels containing ten stories each which are meant to improve your reading and listening comprehension. Unfortunately, they don’t appear to be available on the app. It is very easy to sign up to Duolingo and you can pretty much start your language learning within seconds of reading this review if you wish to try it out for yourself. Duolingo is very well presented and they certainly make it easy for people to use – you don’t even need a profile though they will encourage you to sign up either through facebook, twitter or by email. After selecting your language of choice, you complete a short placement test to determine where you should start with their exercises. What comes in handy at this early stage is that when you click on a word or hover above it, the English translations for it will appear. As a beginner, you will likely be placed at the start. After using Duolingo for a while, if you feel the level is too low or too easy for you, there is the option of taking a short test which helps you skip ahead of some of the exercises. This kind of indicates in itself that the platform mainly caters to casual learners. At various times through your learning journey, you will be also asked if you would like to increase the amount of time you spend using Duolingo. Each short exercise only takes around five minutes and it is pretty easy to whizz through quite a few of them in one go. This is in part the appeal of Duolingo; if you are bored or on the way somewhere you can easily ‘study’ and complete a few exercises in no time at all. The exercises help you to learn Portuguese in a variety of ways and you get to practice speaking, writing, reading and listening. All of the exercises are very short so you will at most hear or see a short sentence of fewer than ten words. This means you only learn snippets of Portuguese in isolation from the larger context. Unfortunately, the content is also quite random in terms of what they teach you, both at the beginning and later on. While there is definitely a progression in difficulty levels, the content is not all that useful. The short exercises are geared towards beginners and even if you know no Portuguese at all when starting out; it shouldn’t be too hard to complete the early sections. From listening to a short phrase in Portuguese and writing it down to matching the English word to its Portuguese equivalent, the way the exercises are set up means you’ll never be stuck for long. As aforementioned, you have to answer enough questions correctly to progress to the next level. This is just one of the examples of how Duolingo makes language learning a bit of fun and game-like. You are also rewarded with points for answering questions correctly and with lingots (a sort of currency within Duolingo) for completing different sections. On top of the points and rewards, the platform strives to motivate you in a number of ways. A series of positive messages greet you at various times, triumphant music plays after you progress with your studies and previously grey and drab uncompleted skills turn colourful. If you use the app you get reminders to check in and study and you can also receive email reminders as well. The Portuguese course that Duolingo offers is comprised of 69 different skills for you to complete, each with a varying number of sections to them. While the difficulty level does increase somewhat, the format remains the same. The length of each skill and time it takes to complete also remains constant. There isn’t the same level of progression like with other language learning resources where you might start reading longer texts and listening to longer passages of spoken Portuguese. The way the content is structured is also a bit off-putting as you learn some pretty unnecessary vocabulary early on when your time would be best spent learning the basics. Learning how to say bleach seems very much like advanced Portuguese to me. Duolingo essentially has a huge number of weak points which actually makes it a challenge to list them all here! To start off with, regardless of the skill you’re working on, there is no cultural element about the lessons at all. You could be learning Portuguese in a vacuum in outer space for all the connection it has to Brazil or another Portuguese-speaking country. While the picture of the app is of the Brazilian flag, some grammar points early on focus on words that are actually used in Portugal and not in Brazil. This makes it a bit of a mishmash of Portuguese from around the globe. For learners using the app, the only way they can learn grammar is through mimicking and repeating what the exercise tells them. There is no explanation at all as to why the grammar rules are the way they are. People using Duolingo on the computer at times have access to short grammar explanations. While this is a step in the right direction, the explanations themselves pale in comparison with the depth that PortuguesePod101 and Semantica go into. While you can record your voice and Duolingo rates whether you have pronounced the words or phrases correctly, you can get away with some terrible pronunciation. Unfortunately, this is the only spoken element to the exercises and there is no way to practice conversations in a real setting. I doubt in any case that the content you learn would actually enable you to have a conversation that makes much sense. When completing the short exercises, a number of them involve writing answers in Portuguese. Computer users again have it better here, as you have access to all the accents through a small keypad that pops up. App learners can just ignore the accents and Duolingo will accept the answers as correct anyway. So as you can see there are a number of issues when it comes to the speaking, comprehension, grammar and writing parts of Duolingo. Again, other platforms provide much better resources when it comes to your language learning needs. So what does Duolingo do well? Well, it certainly does a good job of motivating people to use their resource and continue learning a language. When researching what other reviews had said about it, I saw numerous people commenting proudly about the long streaks they had managed to keep up. Duolingo informs you how many days in a row you have used it/studied your language and it kind of compels you to keep it up. As it only takes five or ten minutes to complete a couple of sections, it is relatively easy to keep up your streak and just do a little bit of Portuguese each day. While it may not be the most useful language learning in the world, at least you are doing a little bit. The series of badges and achievements you unlock also help to make you feel like you’re achieving something! After using Duolingo for a short while, you will be prompted to download a sister app called Tinycards. This is basically a flashcard app which has all the vocabulary from the Duolingo Portuguese course already on it. It is actually quite useful and you can make your own deck of flashcards quite easily. While it is not as good as the plethora of packs that PortuguesePod101 has, it is still pretty good if you just simply want to build your vocabulary. Another useful part of Duolingo is the ‘Stories’ section. I could only find this part on the computer and never found a way to navigate there on the app. It is quite an innovative approach to storytelling and I enjoyed the interactive element to it. You answer comprehension questions and fill in different part of the story for it to carry on. In contrast to the 69 different skills, the stories and the questions asked are nearly completely in Portuguese. Again, however, the content is pretty random. While it might make it entertaining, it doesn’t necessarily mean that it will be useful. These stories are more suitable for intermediate learners than beginners although there is never anywhere that you would ever get stuck. If you are using Duolingo on the computer there is also a ‘Discussion’ forum that you can access and you can also join different language learning clubs. By answering questions and posting you earn points and move up a leaderboard. This helps you come in contact with other learners and have short written conversations with them. The Portuguese community, however, did not seem to have much going on. From the discussions, I could see Duolingo seems to have recently changed some parts of its layout and how it helps learners to keep track of their progress. That is positive as it shows they are looking at improving the users’ experience of using their resource. Duolingo is a really nicely put together resource but the main problem is the content itself. While it is great to use and certainly motivates people to study, you’re just not spending your time in the best possible way. In contrast to Semantica, for example, beginners will be able to start from the beginning without feeling overwhelmed. They will, however, miss out on understanding the grammar, immersing themselves in the culture and ultimately from learning the language. Duolingo makes it easy for people to feel that they are learning a language when maybe they are just actually learning vocabulary. Used in conjunction with other language learning resources, Duolingo can be a fun way to learn vocabulary. The best thing about Duolingo is that it’s free to use. While ads do pop up every now and again, like everything about Duolingo they are tastefully presented and feel slick in comparison with other learning resources that have ads plastered everywhere. You can pay to remove them though with one ad-free month costing 9.99 Euros. Otherwise, it’s 6.99 Euros if you pay for 12 months. This ad-free version is Duolingo Plus which also enables you to download the skills and access them when you’re offline. While it is great that Duolingo is free and that anyone can use it, the sad truth is that the content just isn’t very good. Nonsensical sentences regularly arise and the content is organized in a strange way. Right at the start, for instance, you end up learning vocabulary that you will probably never need to know. Although it is fun, you will never really learn Portuguese through using it and I can only recommend it if you use a serious learning resource alongside it. Duolingo could help you to improve your vocabulary but its random nature means it’s not even suitable for people looking to learn a few phrases before going on holiday. While it is free, fun and friendly to use, Duolingo just falls short in way too many ways for it to be a resource that I can recommend. You may have fun using it and a sense of accomplishment at seeing your points and lingots increase but sadly I think it is highly unlikely that you’ll progress much in your Portuguese studies. If you are serious about learning Portuguese, Semantica and PortuguesePod101 are just two resources out there that trump Duolingo in pretty much every way.